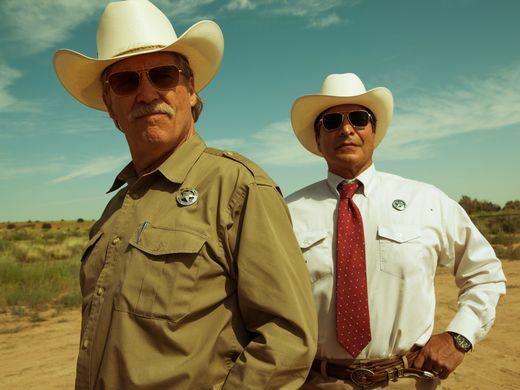 Forty-five years after he appeared in "The Last Picture Show," Jeff Bridges returned to the same small-town Texas setting to make the modern western, "Hell or High Water." It is a story about bank robbers and the Texas Rangers who chase them, but, like all great westerns, it is about the deepest dreams and the deepest divides of America: about race, guns, oil, money, family and real estate. In interviews, writer Taylor Sheridan, director David Mackenzie, and actor Gil Birmingham spoke about the film and its themes. I wanted to explore a lot of different things in this movie. I really wanted to paint a landscape where everyone had a point of view and everyone had a comment, and to do that in this area. There are people who know that West Texas exist but they have never been to it and they have their own preconceived notions about what it is. I wanted to show this region as fully as I could. I spent a lot of time in the middle of nowhere in my life, I grew up in it. I live in it now in a different part of the country. Yes, the big city is so much more intellectual but there's a certain philosophical way of thinking in Texas. I don't know if it comes with having absolutely no one to talk to but yourself, but I've heard some strange and poignant statements from sheepherders, just really fascinating observations of life, because they had three months of solitude to mull it over. I've heard some really profound statements in some very isolated areas and so I tried to impart that a little bit. It was very much one of the challenges of taking on the film to try and reflect that reality as openly and honestly as possible. Obviously me not being from there despite a little experience earlier, I really needed to very rapidly assimilate within that environment. And the very first thing that I did was quite a significant tour of West Texas with my production designer, Tom Duffield and my director of photography, Giles Nuttgens. We went into all the towns that were described in the script including the amazing Archer City which is where they shot "The Last Picture Show." It's 45 years or more since they made that film and it looks exactly the same now. It's kind of incredible isn't it? I think that men talk to each other as much in the silence as much they do in the words. It's a very interesting challenge with this film which has got some very lovely text by Taylor, to also allow the spaces for the sort of silent communication while not boring the audience with really long pause. The two central relationships were both tough love antagonistic relationships where you don't initially think that there is much affection for each other to begin with and then as the film progresses your understanding of that affection develops. And often it's done through teasing and it's nice to explore. And I think that is how of a lot of males communicate. Gil Birmingham plays Alberto, a part Native American, part Mexican-American and the most silent of the four main characters. Alberto is deputy to Marcus, the soon-to-retire Texas Ranger played by Jeff Bridges, who makes endless comments, often racist, intended to annoy or insult him. Birmingham talked about that relationship. I think it really portrays a lot of dynamics that happen in real families. I know in my family we tease each other a lot and we find those buttons and triggers to push to try to get some reaction out, which is what I think Jeff's character is doing with Alberto. They are not necessarily politically correct but Alberto also has an awareness of a man that he loves and cares about who is struggling with the recent loss of his wife and now being forced to resign from a career that he has identified his whole life with. So that's the way I feel about it, it's that inability of being vulnerable to express the love you have, so you do it through jesting and teasing one another. Native Americans have always endured those types of comments and disparaging remarks. In the context of the movie I think the dynamics of the relationship itself speaks in a way that reflects the powerful elements in the native community. These are the tenets that we strive for, compassion and understanding and generosity and respect and that's the way I saw Alberto. Alberto has a keenness and a mindfulness to understand where respect is due for mother Earth, for his friends, for his partner. These things that Marcus says are not necessarily to be taken as insults even though they are not compliments. But there is a sharing of the ribbing and the jabbing that we did. When they were not filming, Birmingham and Bridges bonded by playing music together, which helped them develop the chemistry to play men who had been working together for 15 years. I don't pretend I know the answer. I just show the problem and hold the mirror up and say 'Hey, look at this, maybe here is the reason. Here's some of the good and then here is some of the bad" and then one thing we know is this is what it is. To make the choice that Marcus can only show affection for his only friend on the planet through mildly insulting his race and his heritage is really sad. Most of us aren't either extreme, fully evolved, diverse post-millennial intellectually free individual or knuckle-dragging bigot. Most of us aren't either. We're somewhere in between. To have an opportunity to examine and watch and go, "Well he's a good guy, you can see the good guy but gosh, that's not the way to treat a friend" and maybe that allows for a little self-analysis from the audience. I think there has got to be some understanding of balance and I tried to show the right and the wrong of things and the thinking to do the right and still doing wrong. It's a fascinating culture that needs to be just honestly looked at. And I don't proclaim it. There is no such thing as one view on these issues that I'm dealing with, these are all really tough issues which is one of the reasons they haven't been figured out.